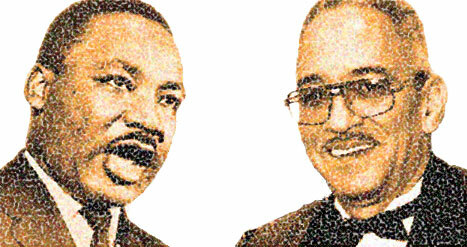 What MLK would say to JW? Most of you have heard the recent controversy of the so labeled racist Rev. Jeremiah Wright, who according to the mainstream media made some incendiary remarks that are construed as racist and unpatriotic. I for one didn’t see anything erroneous with the snippets taken out of context. First, the remarks in context are not as inflammatory as the mainstream media made them to appear to be; and thus has been widely proven after the controversy died down. And I confess that if all that I knew of Reverend Wright were the snippets of those sermons that have run in an endless loop on the television and You Tube, or if Trinity United Church of Christ conformed to the caricatures being peddled by some commentators, there is no doubt that I would react in much the same way. These snippets out of context appear to be unpatriotic but many media editorials have looked back at the controversy and now have made a semi-consensus that these comments are not as evil; given that they are a few words out of the millions of words that the pastor has spoken over the 30 year carreer. William Von Hoene of Chicago Tribune explains the Reverend in a different light. As have other editorials written to show the context of these subsequently branded incendiary remarks, as in the LA Times examines weather the pastor is more outrageous than Frederick Douglass? Friday marks the 40th Anniversary of King’s Assassination. It will be commemorated and talked about as Americans in general have used his legacy to learn about the history of racial divide in America. The conservatives like to bring up MLK when talking about race to claim racial tolerance since some white Americans perceive that African Americans having a chip on their shoulder. Words like ‘reverse racism’ and ‘white discrimination’ on the bases of affirmative action and immigration policy are thrown around. The fact remains African Americans are angry, although that anger is not baseless. Conservative white Americans have resentment, although that resentment is not baseless. After the civil rights movement of the late fifties and early sixties which led to the lifting of some legally and racially intolerant laws of the US, Martin Luther King was regarded as one of the most important people of the world. Despite tensions, MLK’s was given credit and was awarded Nobel Peace prize in 1964 followed by American Liberties Medallion and Pacem in Terris Award in 1965. These among many other recognitions held MLK as the pivotal leader of the American civil rights movement. In 1965, MLK started talking about his opposition of the war in Vietnam. Much like remarks of Illinois State Sen. Barack Obama Against Going to War with Iraq in 2002; King delivered Beyond Vietnam: A Time to Break Silence. In 2002, conservatives labeled then State Senator Obama and anyone else who spoke against the war in Iraq as unpatriotic. And although white southern segregationists have always despised King; his speech against the war in Vietnam turned the mainstream media against him. Eventually, Americans as well as the media started to question US involvement in south eastern Asia. Before the end of the war in Vietnam in 1969, King was already assassinated. And in 2008, forty years after his death his speech against the war in Vietnam will not be seen as unpatriotic rather as good judgment; as has Sen Obama’s speech against the war in Iraq five years later in 2008. Not only is his then position seen as insight but also has catapolted him to presumably get the nomination of the Democratic party for the President of the United States. To my point; what would MLK say about the Rev. Wright controversy? He would say that white American have a tendency to label other races they disagree with as unpatriotic. The only difference is that he would use better words than I ever could. Published by Nolawi April 1st, 2008	in Current Issues and Noteworthy. I sense some similarities between these 2 figures. Dr.King underwent a dramatic transformation from liberal reformer (like today’s democrats)to radical who believed in a reconstruction of the entire society which by the way sets the foundation for a racial equality and continued civil rights movement in the United States. That’s the main difference between Obama and Dr. King. But these days he gets used as a convenient political football by conservatives and even liberals who attempt to ultimately undermine his most radical threat to the status quo. what would MLK say about the Rev. Wright controversy? Maybe something similar to this as well? Marty explains that Wright’s preaching style is at times similar to the style of the Old Testament prophets Hosea and Micah, who Marty says did, in fact, call down curses upon their country for committing injustices. Marty further explains that Wright’s style is similar to the imprecatory topoi and jeremiad in the Old Testament book of Jeremiah, while noting that just as the messages of the Old Testament prophets were ultimately about hope, so have been Wright’s. So as long as I act like the prophets in the Bible acted I am morally accepted, even if my actions can be wrong? Sorry, being off from the topic. A few days ago,I heard on the news that MLK got grade C in his public speech class and i was a bit puzzled. Obviously,his teacher didn’t feel what the rest of the world feels about his speech(or since then he could’ve gotten better through over time, who knows). My point here is that what appeals to me, it may not necessarily appeal to my white friends or vice versa. In my opinion, Rev. Wright style of speech is very normal in many African American churches and i would think that MLK would be proud of Rev. Wright for telling it as it is. In a way, it’s very hard to assume this, though because we’re living in a such politcal correctness world these days and who knows, MLK might not agree with him and asking him to resign :=). Let me try and see if I can imagine what think MLK might say.. that based on the reaction to the Reverend’s speech America is a country defensive about its race history and its long term effects. He would talk of institutionalised racism with policies for back up that on the one hand are designed to keep certain groups on the bottom of the pile whilst urging individual from those groups to succeed despite it and with very little help .This is not demanded from other races he would point out, and moreover would be classified as racial discrimination, but if the people it affect speak of it then, they have “chips on their shoulders”. He would probably agree with some of the content of the Reverend speech if not all and in their wider context but I think he would articulate it differently…. And on a different note I hope he would denounce liberals (Hilary type of liberal) who are not above using the Civil Right movement or his name or the issue of race and racial stereotype in order to gain politically…why is she &hubby not denounced as much as the Reverend? she may have stayed the right side of patriotic but she used race tensions as any racist would have…. No doubt the Rev’s comments have been the media’s “Addis guebi toy”. Unfortunately, in this historical Presidential race, these comments will stick out like a sore thumb. Perhaps every white person that seems to be shocked by what Rev. Wright’s words is really being sincere and never looked at America’s situation from a different point of view. My point here is that what appeals to me, it may not necessarily appeal to my white friends or vice versa. is where I’m trying to get at. Well said! This reminds me of Richard Pryor’s stand-up comedy bit, later used by Dave Chappelle, on the topic of police force violence towards black people and how oblivious white people were on this situation. I believe it. it is Buchanan after all…right wing racism finds no wrong with justifying slavery. Hmmm,”Second, no people anywhere has done more to lift up blacks than white Americans. Untold trillions have been spent since the ’60s on welfare, food stamps, rent supplements, Section 8 housing.” Why i’m finding some truth in this? On the other hand, it strikes me odd that ppl never think of reconsider paying their taxes when it comes to government squandering their money on pointless wars or corporate welfare. So Grama Ma, next time your mind says, “to pay or not to pay taxes” please consider the fact that the “abuse” you referred to practically cost you nothing compared to the billions and billions that the governments spends on corporate welfare like bail outs, subsidies, handouts and special deals or the trillions on war profiteering. Nolawi, excellent piece. I have been wanting to write a similar piece, you beat me to it. We have seen the hate, disposition, anger, and spite towards Rev Wright, whether taken out of context or not. We will continue to see White America criticize folks who speak the truth with honesty and pain, especially when it comes to race relations, atrocities, foul play, or negative actions. The bigger question is, what to do and how to move forward. Barack laid it out on his speech and stayed above the fray of hate filled arguments/discussion/communication that doesn’t really satisfy the pundits, mostly the right wing. Let’s hope it bridges the gap. Patriotism is practiced completely different here in the US. True definition in most dictionary clearly indicates that it’s the “devoted love, support, and defense of one’s country; national loyalty”. That’s not what I see here, it’s about doing right or wrong, moral or immoral, we should support what our country does; and I completely disagree and so does most of the world. Loving a country that does what humans consider immoral, negative, offensive, abusive is and shouldn’t be considered as loving your nation. And that’s where speaking out against that is held in a negative drag. Mind you, Rev Wright is not the only one who speaks on such political issues and takes a controversial stand, many more, white and black pastors continue to do so every day. But lets blanket those who are tough and don’t look like us is the motto practiced by White America and right wing media. Thanks for a brilliant post. I’ll take this info into account when I’m working online and visiting great sites like yours, looking for info like this.